Whilst I have been away from blogging (busy with craft fairs) one thing that I have done is join the Handmade in Europe Guild on Artfire and, I love it! 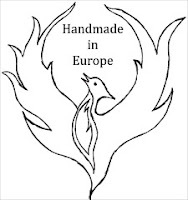 What a great bunch of handmade artisans I am now a part of, we have a weekly chat and run challenges, have the Handmade in Europe blog, are running a tour of our studios with Flappy Flambe (more another time) and help to promote and support each other. So take a look and see what fabulous talent Europe has to offer the handmade world! Christmas in July is Here Again! Now that we are almost half way through July, Christmas descends on Artfire. That's right, it's time for Christmas in July. At Artfire, there is a new trend set up to feature items ready for Christmas in July, these might be Christmas cards like those from Butterfly-Crafts or items that could be bought early for Christmas presents including jewellery, handmade soap, christmas decorations and bags. To celebrate Christmas in July, I am offering a 15% discount from all Christmas Cards and Christmas Decorations from the 12th to 25th July (inclusive) if you use the code CIJS2010 at checkout.